If you are using version 5.7 of the JChem cartridge please consult the JChem Cartridge installation guide. This guide describes how to create a standard table in an Oracle user 'IJC_IDXOWNER', add a JChem cartridge index to it. Next, access this index from another non-default schema named 'IJC_IDXUSER'. Previously, the tricky part of this was getting the Oracle level permissions correct for each of these users, but now there is a much improved administration for this. The table owner where we create the cartridge table and associated index is 'IJC_IDXOWNER'. The JChem cartridge owner (where the cart is installed) is 'JCHEM'. The Instant JChem user is 'IJC_IDXUSER' and we access the cartridge index in the 'IJC_IDXOWNER' schema from here. Please see the JChem cartridge administrator's guide for details. For the purposes of this example we assume you should need to have these roles defined and available. In the latest 5.7 cartridge installation process the JCC_BASIC_ROLE is created for you. However it is not 'given out' until it is explicitly granted to your 'IJC_IDXOWNER' user. Subsequently, any user (e.g. 'IJC_IDXOWNER') granted this role will be able to create and own JChem cartridge tables/indexes. The older approach to setting up a cartridge index user employs the use of JCC_IDX_ROLE and this is mentioned below where required for backwards compatibility. The new approach negates the need to set up this role. 2. Create the user and set up privileges, 5.7 and pre- 5.7 cartridge. There is now two routes which can be employed to get the job done. The older pre 5.7 route is described first and the new 5.7, easier route is described after it. You are encouraged to upgrade to version 5.7 of JChem and adopt the easier route! For both old and new approach, first connect to your Oracle instance as the system user and create the user who will own the index, 'IJC_IDXOWNER' and grant the connect, resource and JCC_BASIC_ROLE roles. <torol>   (c) 1982, 2007, Oracle. All Rights Reserved. From cartridge version 5.7, onwards , you can now run the config-util.sh (or .bat) script with the list-sqls-for-jcc-user-privs argument in order to configure the 'IJC_IDXOWNER'. The information is repeated here. Create an Oracle user 'IJC_IDXOWNER'. Grant CONNECT, RESOURCE and JCC_BASIC_ROLE roles to this user in Oracle as DBA. On JChem cartridge server, in cartridge directory run the config-util.sh (or .bat) script with the list-sqls-for-jcc-user-privs argument. Answer the questions correctly, at the prompt. Perform the operations described as the DBA and JChem users. The user 'IJC_IDXOWNER', is now able to create the JChem and Standard tables with associated cartridge indexes, by right click in the entities tab, select Structures table and use the drop down of table types. Once the script has run, you need to perform the grant operations described between the CUT HERE parts of the output, to give the 'IJC_IDXOWNER' user the necessary access to the JChem cartridge functions. 4. Create a standard table and add to it a cartridge index. 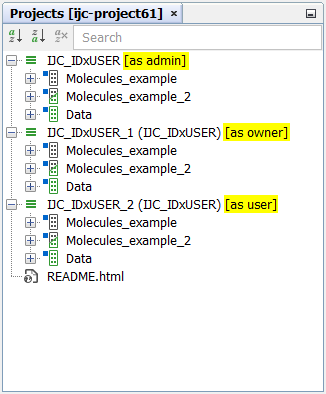 With this configuration correctly in place, it should now be possible to create chemical structure based objects that are accessible when connected as the 'IJC_IDXOWNER' user. Further to this, it should be possible to create either a JChemBase or Standard (non-JChemBase) table with a cartridge index directly from the IJC user interface, connected to this user. For this example, we choose to create the latter table type manually, as below since this simulates the common scenario of integrating legacy data sources, that are not in any standard JChem format. Everything should now be working directly in the 'IJC_IDXOWNER' schema. Next, we can give controlled access to this IJC_IDXOWNER's tables and indexes to a read only user 'IJC_IDXUSER'. 5. Giving the 'IJC_IDXUSER' user access to the 'IJC_IDXOWNER' table and index. If you want this user to be able to own cartridge index then please see above regarding the JCC_BASIC_ROLE and prior to version 5.7 of the cartridge this role was also required for the the index user. Prior to cartridge version 5.7 an additional role is required, namely JCC_IDX_ROLE. Any user granted this role (e.g. 'IJC_IDXUSER') will be able to access JChem cartridge indexes owned by someone else (e.g. 'IJC_IDXOWNER'), providing those indexes are configured correctly for the role, as explained below. The JCC_IDX_ROLE is somewhat more bespoke to your specific set up (set of index) and thus needs to be created and configured by the administrator. Prior to cartridge version 5.7, you will need to complete the full configuration of this role. In addition, a bespoke role JCC_IDX_ROLE is required to be created and configured. For information on setting up a bespoke role like JCC_IDX_ROLE, please see the relevant section [ |JC:jchem_doc_admin_cartridge#users] of the JChem cartridge administrator's guide for more details. In particular note the .init() call and general table grants. Note that the four 1 and 0 arguments in this example only grant access for searching the index. If you insert, update or delete access as well change the 2nd, 3rd or 4th numbers to ones accordingly. It is now possible to grant the role to the IJC_IDXUSER user and access is given. Please see the cartridge administrators guide for fine details on setting up roles like JCC_IDX_ROLE. In addition IJC currently requires you to grant permissions to the cartridge property table. From cartridge version 5.7, onwards , you can now run the config-util.sh (or .bat) script with the config-index-user hopefully removing the general pain from this configuration. The associated elements of the role are still in place but the role itself is not formally required. Create an Oracle user 'IJC_IDXUSER'. Grant CONNECT, RESOURCE and JCC_BASIC_ROLE roles to this user in Oracle as the DBA. Grant SELECT, INSERT, UPDATE and DELETE privileges on the JCHEMPROPERTIES and JCHEMPROPERTIES_CR tables in the index owner's schema ('IJC_IDXOWNER') to the 'IJC_IDXUSER' schema. Grant SELECT privileges on the JC_IDX_PROPERTY table in the index owner's schema to the 'IJC_IDXUSER'. Grant SELECT privileges on the sequence used for generation of IDs in the structure table (optional, you can use the Null value generator if you are not wanting to insert new rows). This step is really only relevant for Standard tables + index which have a potentially unknown sequence name. The user IJC_IDXUSER, is now able promote (Schema editor, tables tab) either JChem or Standard tables that have associated cartridge indexes that are owned by another user, for example IJC_IDXOWNER. The access level of each depends upon the previous configuration options. An example of using the config-util.sh script with the config-index-user option is given below. Please note the index name prompt expects a single index name. If you have multiple names you will need to repeat the final privman_pkg call for each index that you wish to use. The name of the index (IDX_BUILDING_BLOCKS_GB): IDX_BUILDING_BLOCKS_GB -- if more than one index, need to specify one and repeat from script. Grant the privileges as described (unless you chose to let the script do this for you). Don't forget, you will need to repeat the above calls for each index you wish to grant access to, only the one you specify is done for you! Connect to the 'IJC_IDXUSER' schema using InstantJChem application. Include the 'IJC_IDXOWNER' schema as an additional schema (schema tab -> database schemas then add). Promote the relevant 'IJC_IDXOWNER.STRUCTURES' table to a Standard entity + JChem cartridge in IJC. Confirm that you can see the 3 structures and run structure searches successfully from the grid view.